Type ‘Recipe Box’ into Google and you will come up with a huge number of hits. There seems to have been an explosion of recipe boxes in recent years – it’s not surprising really – they are such a great concept – perfect for those of us who lead busy lives, but still wish to eat well. The idea is really very simple. Someone else creates the recipes and does all the shopping for you. 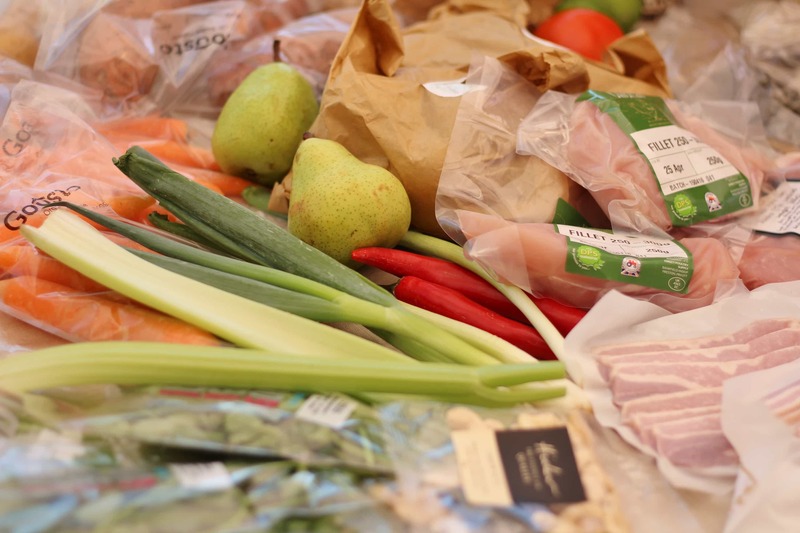 They deliver the box of ingredients at a time convenient for you and then you have everything you need to make several delicious recipes already measured out for you, without having to plan your meals, go to the shops or decide what to have for dinner. Sadly none of the services I checked out have worked out how to do the washing up for you as well…yet! 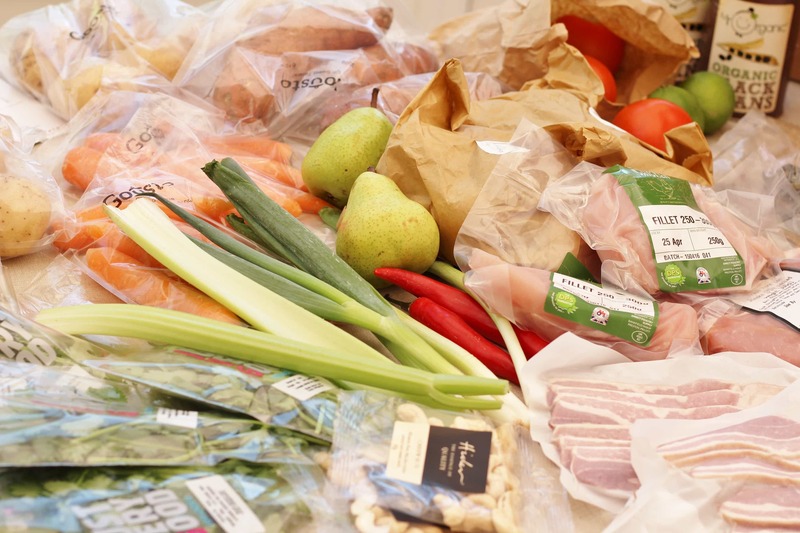 So what exactly is Gousto and how does it work? 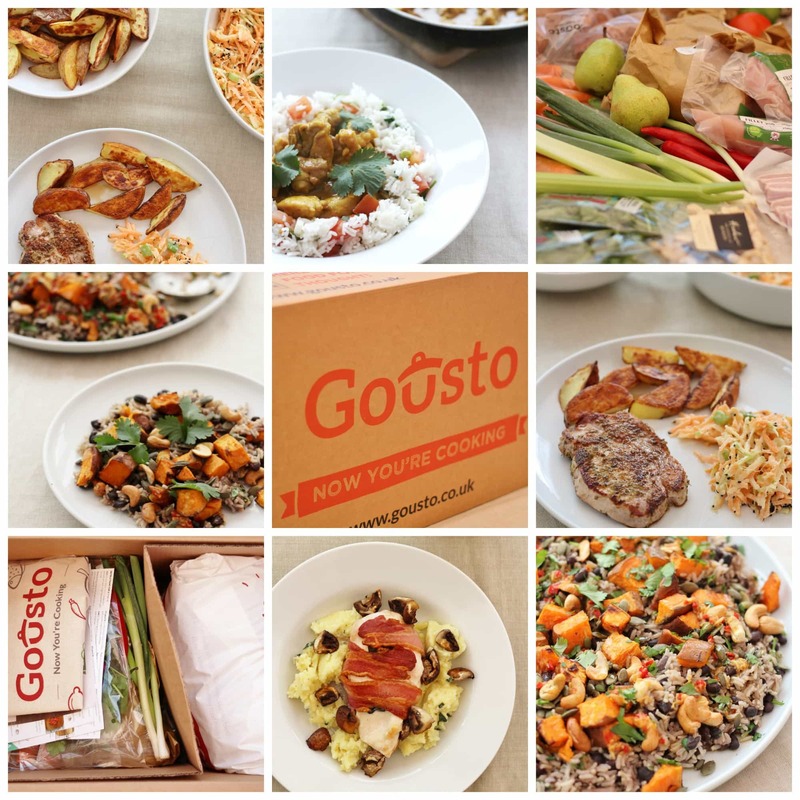 Gousto is one of a whole bunch of recipe box providers who offer to sort out dinner for you. You still have to cook dinner (and do the washing up) but they will sort out the rest – a bit like a halfway house between a takeaway and a home cooked dinner from scratch. The idea is each week they provide a list of 10 recipes and you choose which ones you want to make – they then deliver the recipe cards and ingredients on a day of your choosing and you cook the recipes – a pretty simple concept really. Better than that, though, Gousto also promise that the recipes will be healthy, quick to make and – because the ingredients are perfectly portioned for the recipes – they will help you to reduce your food waste too. 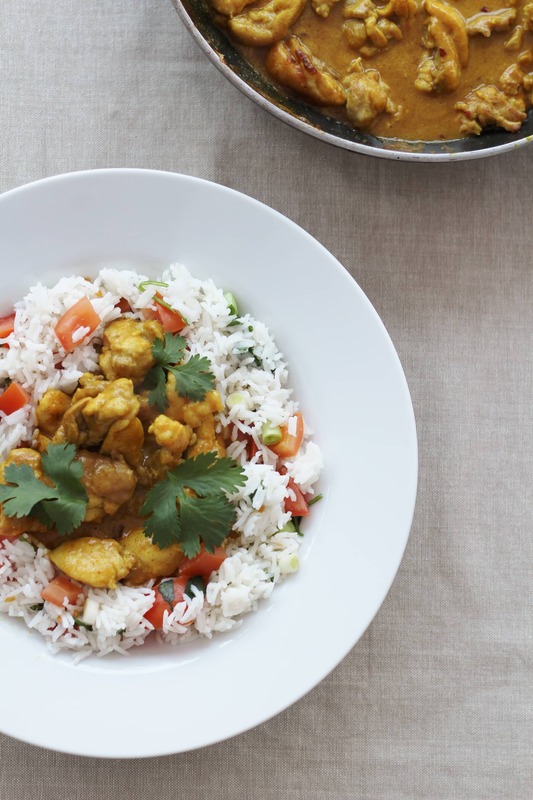 Ordering from Gousto is unbelievably simple. As soon as you arrive on their website, you have a great big button that says SEE MENU – when you click on that you are taken to a screen where you can clearly see their delivery days – they deliver on Mondays, Wednesdays, Fridays and Saturdays and you have to order at least three days in advance. Once you’ve chosen your delivery day, you are then presented with all the recipe choices for that week – 10 in total. And what a selection! All the meals looked wonderful – I could have happily chosen any of them. Better still there was the option to sort the recipes by 4 different categories: Healthy, Veggie, Quick and Top Rated. I especially loved the fact that it was so easy to see at a glance which were the quick options. If you are in a hurry, you hit the Quick button and it sorts the options into speed order, highlighting the ones that take the least time to make. The quickest recipes say they take only 20 minutes to make, but even the longest ones only say 40 minutes. Similarly, if you are a vegetarian, you hit the Veggie button and you are presented with 4 delicious veggie options (and it hides the meat and fish ones completely) – I would have been totally happy to eat any of the vegetarian options – they all looked wonderful. Better still, you can click on each recipe option and see exactly what that recipe contains – great for those with specific dietary requirements. Each recipe also has a detailed nutritional breakdown – great if you are watching your weight or on a specific diet. However sadly, due production and packing methods, Gousto are unable to promise their products are gluten, dairy or nut free, which is a shame. From these 10 options, you can select 2, 3 or 4 of the recipes and choose whether you want a box for 2 or 4 people. I thought it was a shame they didn’t offer a box for 3 people – there are four of us, but my kids are young (5 and 7) and only eat about 1 person’s worth between them…a box for 3 would have been perfect for us. That done you hit Continue With Checkout and continue much as you would if you were buying something from Amazon. There is also the option to put in a voucher code, if you have one – and if you don’t, they give you £15 off your first box anyway – how nice is that? Well, after much deliberation, I chose 4 recipes (well, I had to give it a fair go didn’t I?) 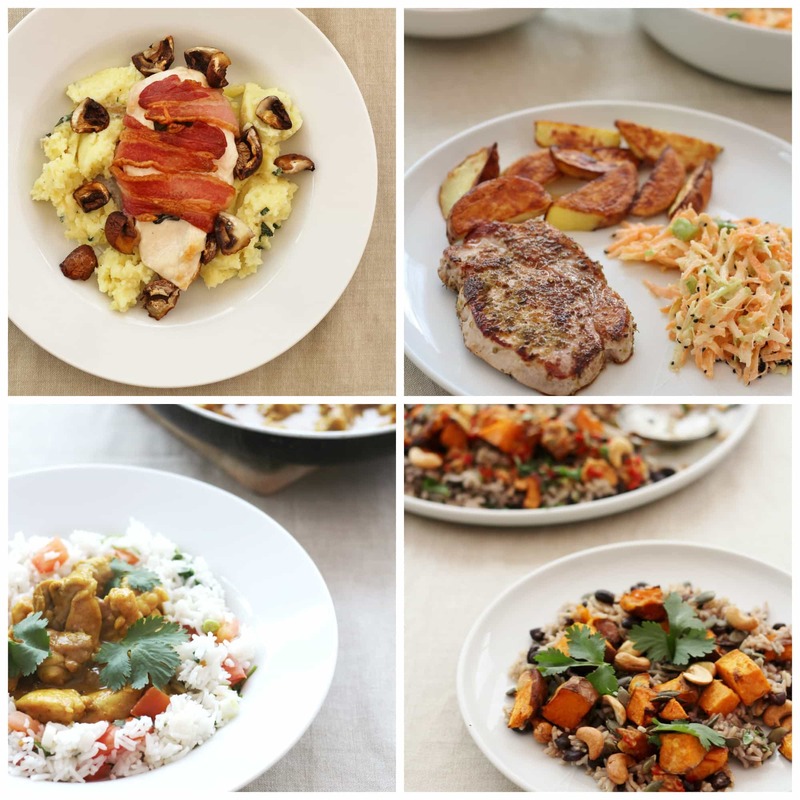 The recipes I chose were: Curry in a Hurry, Chilli Lime Sweet Potato Rice Salad, Herby Pork Steaks with Pear Slaw and Bacon and Sage Wrapped Chicken, but honestly I would have been very happy with any of the choices – it was a great selection. I chose to go for a box for 4 people – I didn’t want to end up with not enough food if the portions were skimpy. Helpfully you can see exactly how much of each ingredient you get in the 2 and 4 person boxes to guide you as to which box might be most suitable for you and your family. The Bacon and Sage Wrapped Chicken, for example, featured one large chicken breast between two – I felt dividing one chicken breast between 4 would be a bit of a stretch! One last tip for ordering – I would definitely try and order a bit ahead of time – they have finite amounts of all the ingredients. I noticed when I checked the menu on a Wednesday, they only had about half the menu options available, if you wanted to order for Saturday, for example, but plenty of everything if you wanted to order for Monday. Gousto is not a cheap option – a box of 4 recipes for 4 people normally costs £59.99, so that is £15 per meal or £3.75 per head per meal – that’s more than we’d usually spend. BUT you do have to bear in mind that you are not just ordering food you are also getting the recipes, paying for someone else to do your shopping AND you are not going to waste anything as the ingredients are perfectly portioned for the recipes you are using. The quality of the ingredients is also high. One thing that did slightly irk me, though, was the fact that the veggie recipes were exactly the same price as meat ones – experience tells me that meat recipes are usually much more expensive than veggie ones, so the vegetarians must be subsidising the meat eaters in this scheme – great if you are a meat eater, not so much if you are a vegetarian! I loved how clear the delivery information was on the Gousto site – they deliver on Mondays, Wednesdays, Fridays and Saturdays. Unfortunately they can’t offer a specific delivery slot, which is a bit of a shame – delivery could be between 8am and 7pm, but they do deliver the boxes in special packaging which means your food will stay fresh until midnight on the day of delivery and they are happy to deliver your box to a neighbour or leave it in a safe place for you. Gousto deliver to almost everywhere in mainland UK and clearly state which postcodes they don’t deliver to in their FAQs. Delivery is free – hoorah! 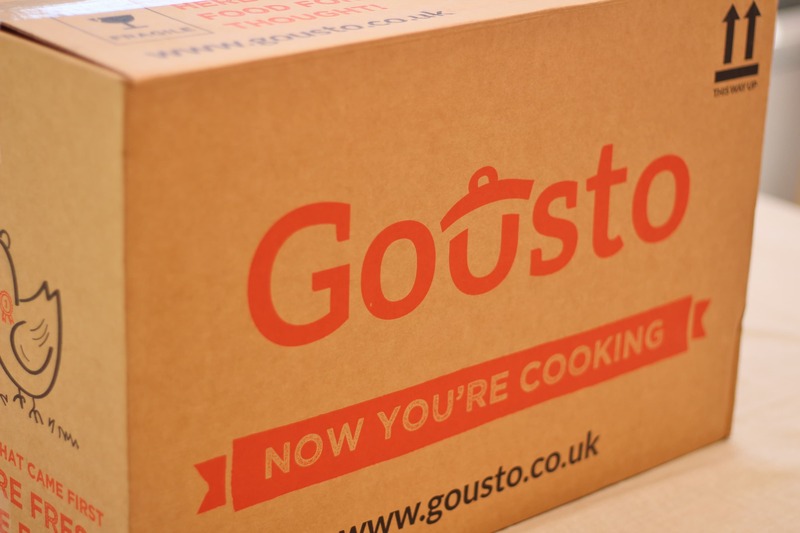 As if Gousto couldn’t get any better, I got to exactly this point in writing my review, last Wednesday when the doorbell rang and my Gousto delivery arrived – can’t guarantee this is a service they offer to all reviewers, but I nearly fell of my chair at their perfect timing! Inside the box the produce is beautifully packaged. My box was divided into two compartments, one containing all the fruit, veg and store cupboard items, the other containing all the meat and dairy. 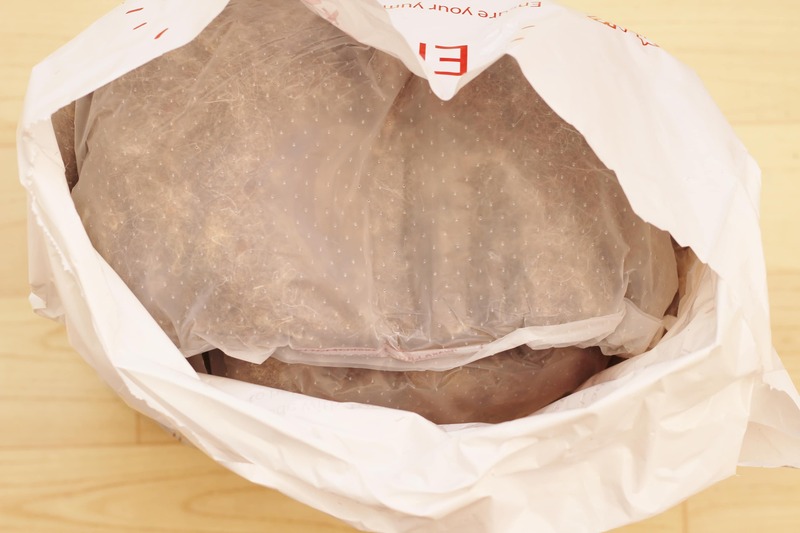 The meat and dairy is packaged with ice and wrapped in wool and then plastic to ensure it keeps cool for hours. It was slightly disconcerting getting all the meat and dairy all jumbled in together, but all the dairy items are in their own little plastic bags to keep them separate from the meat. 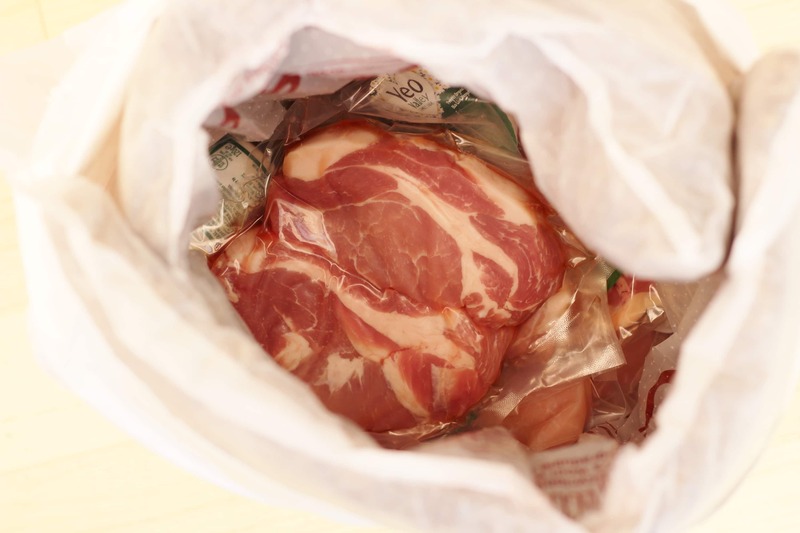 In fact, there are a lot of ingredients that are wrapped in plastic bags – partly to ensure there’s no cross contamination but partly to ensure you know exactly what is for which meal. So for example two of my meals contained potatoes and the potatoes for each meal are wrapped separately so you can see at a glance which is for which meal – great for convenience, not so much for the environment! We have tested all four recipes and have found them all to be delicious, quick and easy to make and would be delighted to have any of them again – on that subject, if you do like what you try, you can find all the recipes for their past menu options on Gousto’s online cookbook. In fact, even if you don’t want to try out this ridiculously good service – I would well recommend their online cookbook just for getting some great new recipes! If you’ve been following me on social media you will have seen a few of these photos already…What you don’t follow me, already? Better start now! I’m on Twitter, Facebook, Instagram and I often share some behind the scenes/sneak previews on there – so follow me there if you want to find out what goes on between blog posts! This was the first recipe we tried and it was a fab one to start on. 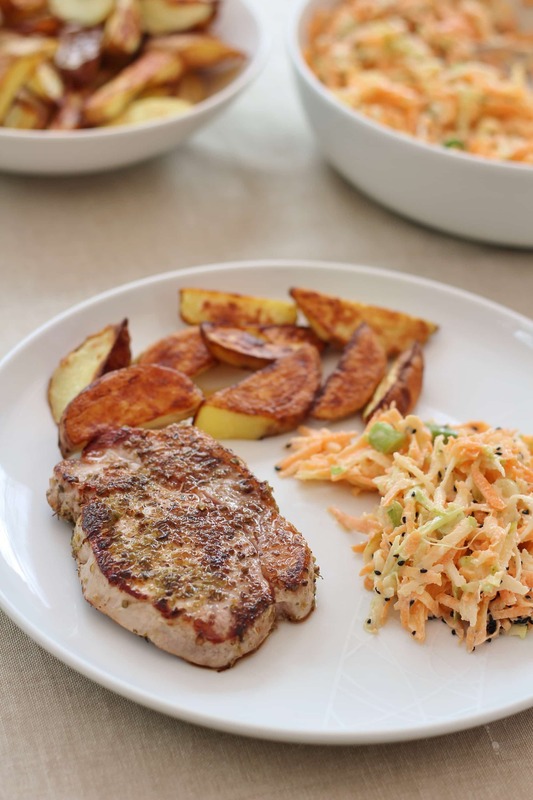 There were three parts to the dish – homemade oven chips, a simple coleslaw and pan fried pork steaks. I was really impressed how easy the instructions were to follow and how simple the prep was. I am not always a fan of coleslaw as it is often dripping in mayonnaise – but I was really impressed with this one – just the right amount of dressing and the addition of pear was inspired! The quality of the ingredients really shone through – the potatoes and the pork in particular. 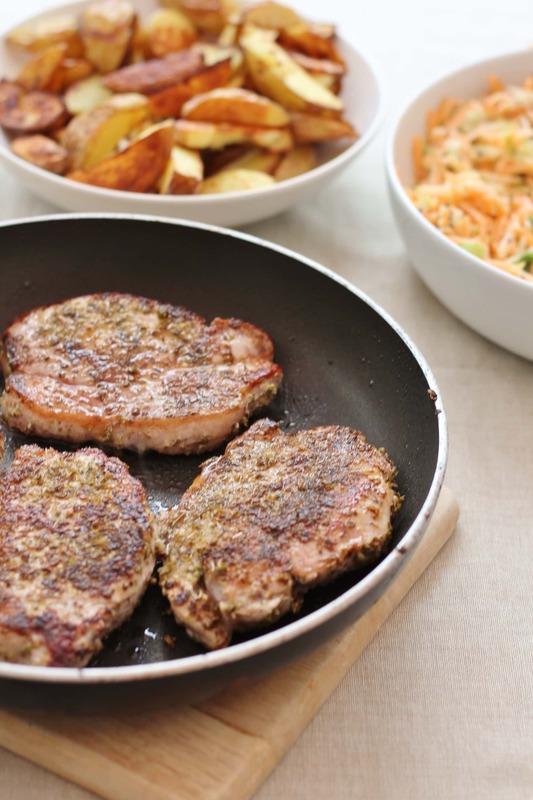 And I loved the idea of using pork steaks rather than chops – no messy bone to contend with! Not only did the meal taste great, but it also looked beautiful too – as did all the meals – I loved sharing my pics on Instagram and Twitter! This was probably our least favourite meal – that’s not to say it was a bad meal, just the worst of the 4. It’s the only one I would significantly adapt if I made it again. 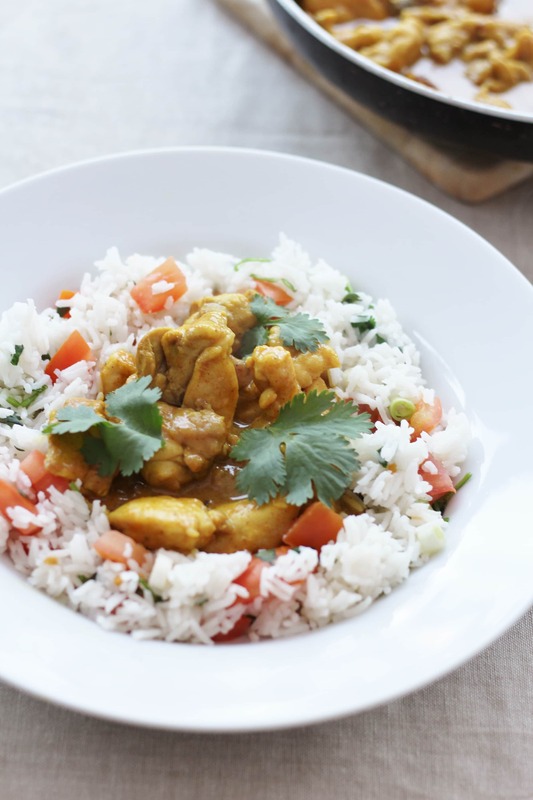 The curry was really hot – I put in a quarter of the chilli flakes suggested and it was way too hot for my poor kids! I also didn’t really like the addition of coriander, spring onions and tomatoes in the rice – it didn’t work for me, especially given the tomatoes were not that great quality (the only ingredient in the whole box that wasn’t, mind you!). If I was making this again I would put the spring onions, coriander and tomatoes in the curry (and lose the chilli flakes altogether) and serve with plain rice. For me that would taste much nicer and would hide the fact that out of season tomatoes don’t usually taste that great! The other problem was that the curry took considerably longer than the recipe suggested – it said it would take 20 minutes and it took nearer to 40 – and I’m not a slow cook! I dread to think how long it would have taken my husband to make!! I think one of the problems is the recipe cards give you the timings for the 2 person meals (I am guessing) – it obviously takes longer if you are doing a bigger quantity. Most of the time I wasn’t bothered that the recipes took longer, but on the day I made this curry I was actually in a hurry! That said, it was still a perfectly nice curry and not too hot for me or my husband. Just not outstanding, as all the other recipes were. This was awesome. We had this for our Sunday lunch and we all really loved it – the kids thought it was brilliant and this was definitely their favourite recipe. The chicken breasts were halved and wrapped with bacon and sage before being grilled alongside the mushrooms (loads of mushrooms – 500g!! They wouldn’t all fit in my grill pan!). The mash was flavoured with more sage and it was all served with a simple sauce made with clotted cream and the meat juices. 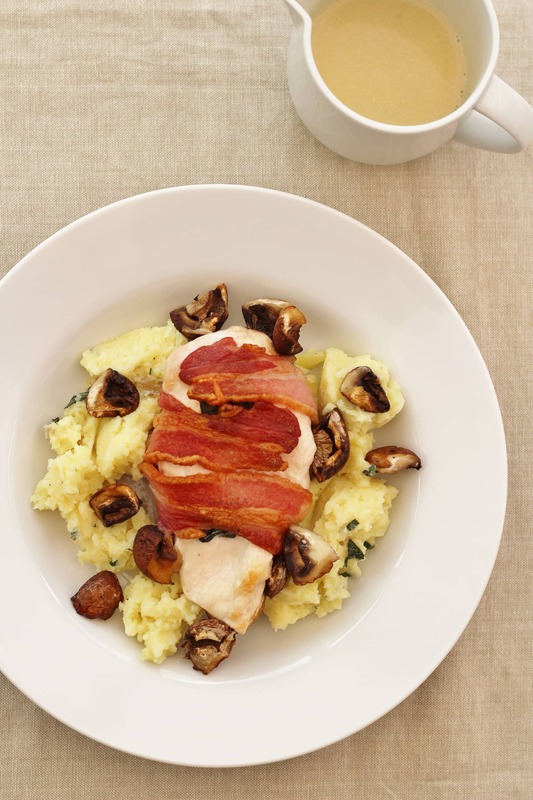 All the flavours complemented each other perfectly – the combination of bacon, sage and chicken was amazing and I loved the idea of adding sage to the mash – I will definitely be doing that again. In fact, I will be doing this whole meal again – it looks amazing, but was actually quite easy – it would be a lovely one to do for a dinner party. 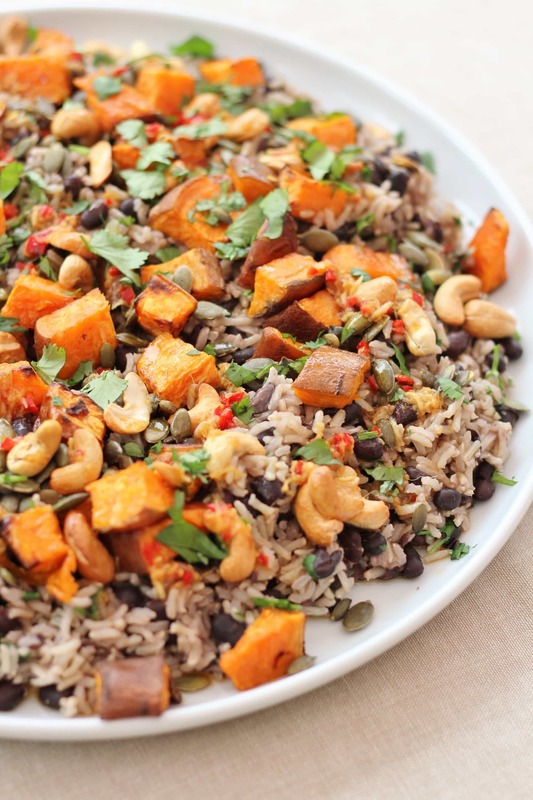 So this recipe is basically all my favourite flavours in one dish: I adore roasted sweet potatoes, coriander, limes, brown rice, black beans, pumpkin seeds and cashew nuts and Asian flavours like soy sauce, ginger and chilli and this is all these flavours packed together in one lovely warm and super healthy salad. When I saw this advertised on the website, I knew I had to have it and it definitely didn’t disappoint! In fact, as is so often the case, when all put together, the salad was even better than the sum of its parts. And, despite, my husband and I eating massive portions of this, there was still plenty left over for us both to have it cold the next day for lunch – when it was equally scrumptious, if not better! Another one I will definitely be making again. I can honestly say almost everything. The choice is fantastic, the website is fabulously user friendly (I’ve used a few of these type of sites before, and this one was by far the easiest and most user friendly), delivery was super-efficient and worked out brilliantly for me, the recipes were easy to follow and the meals delicious! I was also really impressed with the quality of the ingredients. I love how the recipes are healthy and ethical, and there is lots of information on the website – Gousto’s FAQ section is very comprehensive. 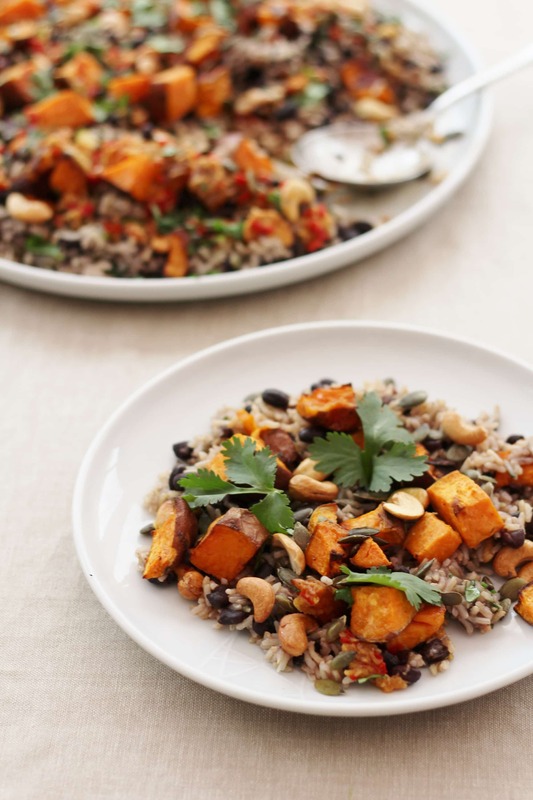 This is clearly a scheme geared towards people who don’t have a lot of time but want to eat well – in short it’s easy peasy but totally foodie too – you can see why I am a fan! I also love how it encourages you to be more creative in the kitchen and introduces you to recipes you might not otherwise have tried. Once you have the recipe cards you can make them again and again. If you are feeling like you are a bit stuck in a rut with your cooking, you could just order a few weeks of these boxes to give yourself a bit of a culinary shake up and then carry on doing your favourites. I also loved how this service can be a subscription service – once you’ve ordered they’ll just keep on delivering you boxes without you having to do anything until you tell them to stop. Or you can do it as a one off – there’s no catch or commitment. If you decide it’s not for you then you just log in and cancel at any time. It’s not great for those with allergies and specific dietary requirements – they are quite clear on this in their FAQs – there is a possibility that the food may contain gluten/dairy/nuts etc. so if you are properly allergic to these things, then Gousto is a no no. Having said that if it’s just something you are trying to avoid or don’t like very much, you can check out the specific ingredients of each recipe to make sure it is suitable for you. It’s expensive – no two ways about this. 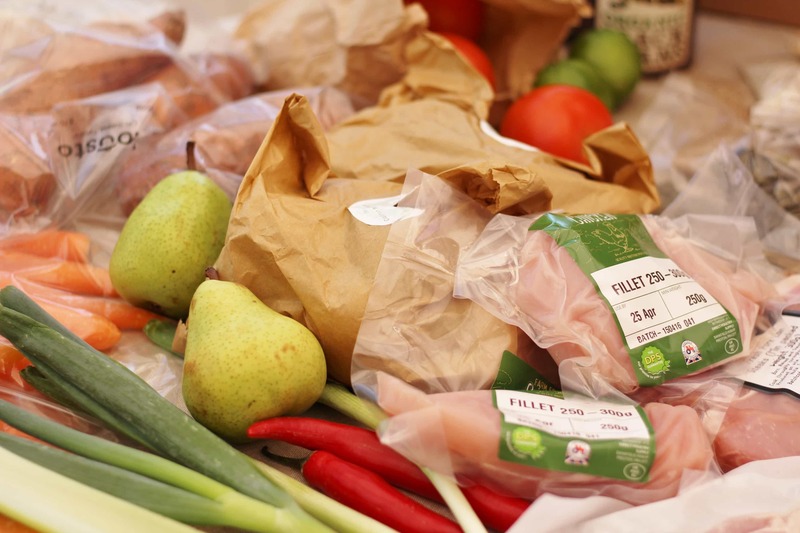 It’s not a cheap option – £15 for a family of 4 is more than I would usually pay BUT you are paying for the convenience and to many people that’s worth a lot AND remember you are not wasting food, so it may be cheaper than you think. Gousto is particularly expensive if you are veggie – you pay the same as meat eaters. Though I found the veggie recipe we tried went further than the meat ones (we got a couple of lunches out of it too), so it may not be quite such bad value as it sounds. You can only order for 2 or 4 people. A 3 person box would have been perfect for us, but it doesn’t exist. Likewise it’s not so great if there’s only 1 of you. That said, you could eat it over 2 days if there’s only one of you. Just bear in mind this is easier to do with some recipes than others. There is also not the flexibility to say order 2 portions for Monday (because the kids are out), 3 portions for Tuesday (because your other half is out) and 6 portions for Wednesday (because the in-laws are coming to dinner). Obviously I’m seriously nit-picking here but it would be nice if you could! The portions are not huge. They were perfect for us (we always had about 1 portion left over), but I know from experience my husband and I don’t have massive appetites, compared to many. If you have a big appetite, you may find the portions a little on the skimpy side – especially the meat. That said, if you are looking to control or reduce your portion sizes, then this service could be really good for you – and actually each meal comes in at about 650 calories (it’s quite a shock how little food 650 calories is! I don’t normally count calories and I was amazed!!). It’s only 4 dinners – sadly there is not yet the option to get breakfast, lunch and dinner 7 days a week – how great if they did, though? There’s nothing stopping you ordering 2 or even 3 boxes, though, if you wanted Gousto to cover lunch and dinner for the week (though it would be pretty pricey!). I think it’s a shame they don’t to a 5 recipe box, though – it would be great to have a service that covered the weeknights and then you could do your own thing at the weekend. But seriously, I’m nit-picking here – it really is a great service, if you don’t mind paying for it. So who is Gousto perfect for? If you are super busy in the evenings and don’t want to think too much about food beyond cooking it and eating it then Gousto is for you. It’s the perfect solution for anyone who hates meal planning or shopping for food – all you have to do is cook and eat. It’s great for anyone who wants to get out of the rut of cooking the same old meals every night and wants to discover some new recipes and be a bit more adventurous. It’s also great if you are wanting to a be a bit healthier or maybe wean yourself off getting so many takeaways and ready meals and start cooking from scratch. 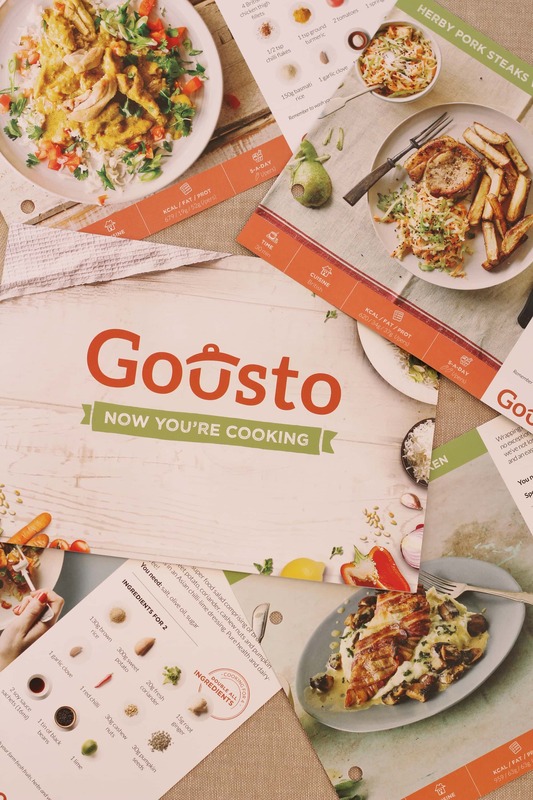 I will definitely be trying Gousto again. It would be great for a week when I am super busy and don’t have time to think too much about food! 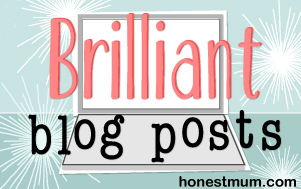 If you enjoyed reading this review and want to read more like it, why don’t you check out my reviews of The Spicery and Riverford Organic Farms? You know Eb, I’ve never tried any food delivery services….not even from the supermarket. I always have the feeling that I’d be palmed off with the bruised spoilt fruit and veg, or things with a particularly short shelf life but your review certainly shows that in this case (other than the tomatoes) it isn’t the case. It’s such a great concept for modern families where time is of such a premium; it’s such a better alternative than ready meals or take outs….all weighed out and the decision making largely taken care off. Though I completely agree with you Eb, it’s an expensive option and even more so for us veggi eating households which is a huge disappointment…. though I do like the sound of the £25 off the first order!. I love the sound of the pear-slaw; I too aren’t a big fan of it when it’s ladened with mayo but your image shows that this version is much lighter on the mayo which certainly appeals to me.